Table of Contents Next: Hill, Harry W.
Dimensions 535'8" by 66'1" by 30'3"
The Hikawa Maru was completed in 1930. One of several similar ocean liners built for the Nippon Yusen line, she was commandeered by the Imperial Japanese Navy and converted to a hospital ship, while her sister ships Heian Maru and Hie Maru became submarine tenders. 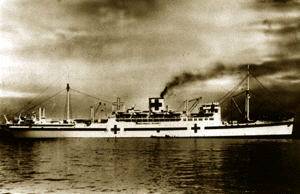 As a hospital ship, Hikawa Maru was not a legitimate military target, a rule of international law the Allies usually respected. As a result, although she was damaged by a mine off Singapore on 14 February 1945, she managed to survive the war, the only large Japanese ocean liner to do so. Postwar, she repatriated large numbers of Japanese servicemen before returning to liner service. She is now a popular floating restaurant at Yokohama.